Two days back surfing through drupalsites.net I stumbled upon DrupalModules.com. 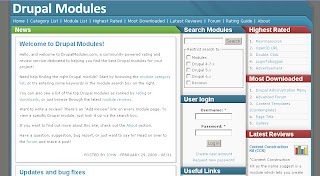 Using Drupal for past 1 year + I was consistently in search of a website that reviewed Drupal modules except of the information given in the download page or the module’s page at Drupal.org. To my happy surprise after finding http://themegarden.org/drupal50/ (A site to test Drupal themes in live environment with content), I clicked thru this astounding website. It is owned and operated by John Forsythe and designed by Blamcast. 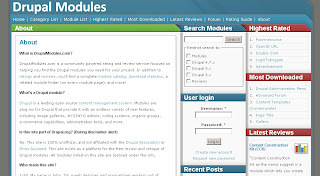 With a clean and straight forward design this site effectively lists the 7 hundred plus Drupal modules to be reviewed and rated on 4 criteria F,R,E and D = Features, Reliability, Ease of Use and Documentation in a scale of 1 to 5. The rating guide at http://drupalmodules.com/module-rating-guidelines gives you the instructions on how to rate the modules on the given criterion like for the Features criterion “Are the features useful? Does the module meet your needs? 5 - Extremely useful. Meets your needs perfectly. 4 - Very useful. Meets most of your needs. 3 - Generally useful. Meets some of your needs. 2 - Not very useful. Meets few of your needs. 1 - Not useful at all. Does not meet any of your needs.”. 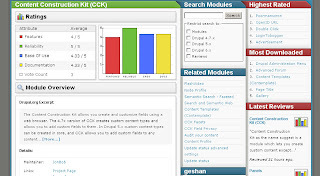 The module page which is optimally laid out has the ratings, module overview with the text (I assume crawled) from Drupal.org, download links with a download counter and reviews showing the last review for the module. An interesting part is that you can see the related modules block that shows the modules related to the current module. When you want to write a review you first rate the module 1-5 in the 4 criteria and give the title of your review and the body or the whole review for the module. You have to register to write a review though. The website does not specifically say how long the review should be but from the small text area given, I speculate that they want the reviewer to write only some lines about the module. The review is instantly visible and the overall ratings are calculated on the fly for the module which is quite predictable. Back to the homepage, its right segment (not calling it the right side bar due to reasons ;-) – ) shows the highest rates and the most downloaded modules in two different blocks. I think they are showing the most downloaded modules as of the count from DrupalModules.com not from the drupal.org download count. The homepage also portrays latest 3 reviews. The forum with only one Container/forum is mainly been setup to acquire feedback about the website. All the other links are predictable and resembles http://drupal.org/project/Modules but the “About” page is very informative and helpful. On top of it the search feature is also exiting where by you can also search for the reviews only for a particular module. To sum it all up, it is a must visit for every Drupal user. If you are stuck someplace in Drupal, need some reviews about which module to use etc cases you can log on to DrupalModules.com and find a solution. Being operational from a short span of time site is yet to accumulate content (mainly reliable reviews from the Drupal Community) but I hope and believe it will do so in a short span of time.